Tue, 21 Sep 2016 at 11:13 p.m.
A slightly larger crowd of Dunedinites arrived at the Mayfair Theatre tonight, and one or two were even angry. The group of candidates was much smaller than last night but as a group the candidates were more impressive specimens than last night. Standout new candidates were Jim O’Malley, Paul Pope, Conrad Stedman, David Murray, Neil Johnstone and Nanette Linklater. Richard O’Mahony was also OK, if unspecific, but Tony Johnston was uncomfortable with the inevitable self promotion and sound bites that one must engage in as a local body politician. There is the sense that Mr Johnston could have value as a councillor with his background but he needs to study Mike Lord or Mr Stedman as examples of how to relate to a crowd. Home ownership is not usually about daring physical feats but nobody’s told outspoken city councillor Lee Vandervis. Kim Dungey reports. I believe that Mayor Cull’s public statement regarding the two Mayoral Candidates with political experience related clearly to Hilary Calvert and to myself, and the Mayor has confirmed this to me [in the same Councillor responsibilities meeting where he said “I have given you nothing”], that he publicly said I had “shonky policies”. I note that the New Oxford Dictionary of English defines ‘shonky’ as meaning – “dishonest, unreliable, or illegal, especially in a devious way”. As a Councillor my public office experience goes back before Mayor Cull’s, to 2004 when I was first elected to the DCC, and my policies have been broadly not to buy things that you can not afford, and not to run two Councils when one Unitary Council could do both jobs much more efficiently. 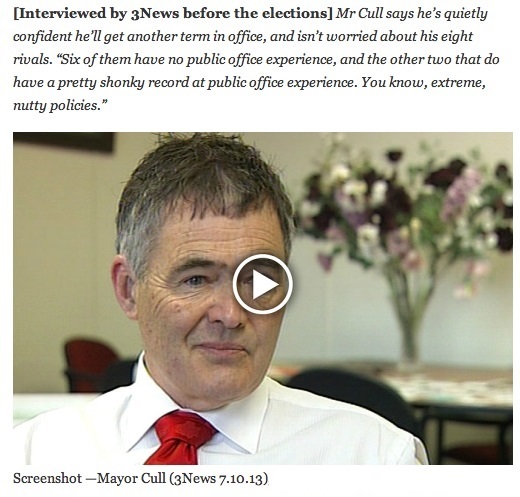 It was unfortunate that Mayor Cull chose to make this public comment without saying which of my policies were “extreme” or “nutty”, or how my pubic office experience since 2004 constituted a “pretty shonky record”. I would like Mayor Cull to explain exactly what in my record of public office experience has been pretty ‘dishonest, unreliable, or illegal’. In any event I believe that Mayor Cull’s statement contravenes various DCC Code of Conduct requirements, particularly J3.1 Relationships with other members. I believe that there are reasonable grounds for believing that at least this provision of the Code of Conduct has been been breached and that the matter should be referred to the Code of Conduct Committee for investigation. Mayor Cull’s statement was certainly offensive to me and offensive to many of my supporters. I need to remind you that on the previous occasion where I made a formal Code of Conduct Complaint of the Mayor to you as Deputy Mayor, that you failed to act on the Complaint and that you stalled proceedings against the Mayor for so long that the Complaint was eventually dropped after a year of inaction by you as ‘too much water under the bridge’. In the event that I do not receive a prompt [within 2 days] decision from you one way or the other, I reserve the right to publicly encourage you to make a decision, something I regret not having done last time. If you find that there are no reasonable grounds for a Code of Conduct investigation, I will welcome the clarity and the new line drawn in the sand regarding how elected members may refer to each other. If you decide that an investigation is warranted and breach of the Code indentified, I look forward to at least a prompt “appropriate apology” from Mayor Cull [J4.2], appropriately on the same Nationwide TV3 news where his statement as above was publicly made. By Brooke Gardiner, 3 News, Monday 07 Oct 2013 8:06a.m. Dunedin Mayor Dave Cull has taken the first opportunity to flex his new mayoral powers by sending a message to outspoken councillor Lee Vandervis. Cr Vandervis has been given no positions of responsibility in a new-look committee structure determined by Mr Cull. Mr Cull told the Otago Daily Times he had given Cr Vandervis no responsibilities because he had no confidence he could contribute constructively, nor maintain any of the relationships needed to do the work effectively. Cr Vandervis warned Mr Cull’s decisions did not bode well for a ”respectful or temperate” council term. The agenda for the council’s first meeting on Tuesday, at which new councillors will be sworn in, shows incoming councillor Doug Hall also gained no responsibilities. Past councillor David Benson-Pope has been appointed chairman of the planning and regulatory committee, with responsibility for lead-up work for the new district plan. Fellow former parliamentarian Hilary Calvert has been appointed deputy chairwoman of the finance committee. Four other first-termers – Neville Peat, Aaron Hawkins, Mike Lord and Andrew Whiley – have all been given deputy chairmanships. Cr Chris Staynes has been reappointed deputy mayor. Cr Vandervis told the Otago Daily Times last night he had a ”short and acrimonious” meeting with Mr Cull on Tuesday, which ended with Mr Cull saying ”I have given you nothing”. ”Quite frankly, he can be a very rude man for someone who can also be so charming,” Cr Vandervis said. He had pushed for the chairmanship of the infrastructure committee after three years as deputy last term, but said Mr Cull told him at their meeting the reason he was not given any responsibilities was because he could not be trusted not to meddle in the operational side of the council. His view that there was ”a lot more clearing out [of council staff] yet to be done” was one Mr Cull ”simply could not tolerate”, Cr Vandervis said. The choice of chairmen from Mr Cull’s political ticket, Greater Dunedin, for four of the five main standing committees failed to recognise voter support for other councillors or use in the best way the business and council experience available. Mr Cull said he decided on the appointments on the basis of skill, experience, people’s interests and their ability to achieve outcomes and maintain positive relationships with staff, without which there was a risk of not reaching any outcomes. The number of votes councillors got was irrelevant to doing the job of achieving the outcomes of the council’s plans and strategies, he said. Cr Vandervis had ended the meeting ”somewhat prematurely” and before being advised, as all other councillors had been, of the appointments. No other councillors raised concerns about the appointments and he felt the group would be able to work together. Mr Cull’s main changes to the committee structure were the addition of a committee dedicated to economic development, chaired by Cr Staynes with two deputies, Crs John Bezett and Andrew Whiley, ”to ensure there is enough resource to drive the economic development strategy within the community”; and the removal of strategy considerations from the finance committee. Strategy matters would now be handled by the standing committee best aligned with the respective strategy. New subcommittees to deal with risk and audit, and grants, had been formed. Appointments to most subcommittees were yet to be made. Mr Cull said he intended to revisit the council’s code of conduct and the mechanism by which any breaches were resolved, and increase the number of public forums. Mr Hall said he was comfortable not holding any positions of responsibility while his conflicts of interest were being worked through, and had agreed that with the mayor. Ms Calvert, the highest polling councillor at the recent election, said she was confident she had something to contribute to the finance and risk and audit areas. Asked if she was disappointed not to have gained a chairmanship or the deputy mayor role, she felt there was a ”lost opportunity” in that the appointments did not reflect the choices voters made. Steve Wilde continues his preview of the approaching local body elections with a close-up look at the metropolitan centres. This time it’s Dunedin… the main issues and what the voters are thinking. Listen to the Integrated Audio [27 minutes] or download as Mp3 or Ogg format. Also check out my Radio New Zealand page and the current Otago Daily News news here.